Take a peek at the technical details of our 13mm 18×7 non-rotating stainless steel wire rope and see what all the fuss is about. Then when you are ready to order, take advantage of our varied contact options to get in touch with Rope Services Direct. Aside from the non-rotating configuration of the wire strands, this 18×7 rope offers a few other design perks that are worth mentioning. First up is the corrosion-beating capabilities of stainless steel rope in general and this product in particular. Maritime customers, as well as those in other industries such as sewage treatment and architecture, can use this rope outdoors without expecting rust to form. Next there is the 18×7 construction’s ability to limit abrasion, ensuring that the surface of the rope is not worn down through use, or likely to leave its mark on other surfaces that it moves across. With a 13mm diameter, this rope configuration is capable of delivering a load capacity of 8,884kg. It is also rated to take a breaking force of 87.1kN, all while tipping the scales at 676g per metre. Find fittings on our site and ask our team to add them to your order so that your stainless steel non-rotating rope arrives ready to put into action. For a quick conversation on the phone, call 01384 78004 to speak to a member of our sales staff. Email your wire rope questions to us direct from our website if this is your preference. 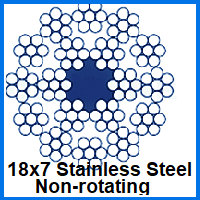 13mm 18x7 Non-Rotating Stainless Steel Wire Rope Overall rating: 5 out of 5 based on 6 reviews.